Holistic production: the idea that the Earth's finite resources can be made infinite if recycled. The world's oceans have always been replete with natural resources--fish, salt, plant life, etc. Now, they're becoming known for an abundance of another kind--artifical resources. Plastic and other synthetic materials have filled the oceans over the past several decades to the extreme detriment of marine life. As I noted in a recent article, each year, 16 billion pounds of plastic end up in the oceans. In total, there are about 5.25 trillion pieces of plastic in the oceans today, leaching harmful toxins into the waters. A lot of this plastic ends up in the guts of marine life and birds who accidentally swallow it and still more ends up disintegrating into small bits of plastic that are pervasive and dangerous. Overall, plastic is a major scourge of marine life. At the same time, humanity is addicted to plastic. Plastic is used by nearly every business and person in the world in huge quantities because it's cheap, durable and easy to manipulate and use. The good news is that many people are finding innovative ways to harvest and recycle all the pollution in the oceans. One such company is Bureo, based in California, which makes skateboards and sunglasses out of nylon. 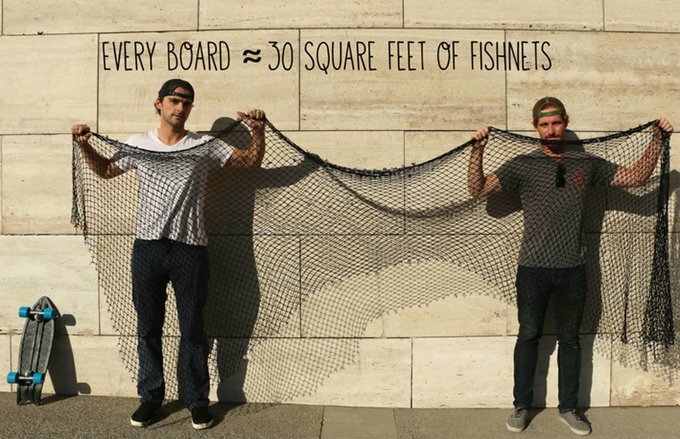 The founders of the company are avid surfers and whenever they went out, they would see lots of discarded nets that happened to be made out of nylon. According to The Guardian, "Nylon, a synthetic fiber made of polymers, doesn’t break down easily and accounts for about 10% of the debris in the ocean." Overall, fishermen dump about 600,000 tons of gear into oceans each year. Nylon accounts for a lot of this waste. To make matters worse, it's challenging and costly to recycle nylon because of the material's specific polymer structure and because its easily contaminated. For many producers, it's just easier to use fresh materials. And for many fishermen, trying to recycle dirty gear is a hassle. So there were a lot of structural impediments when Bureo set out. But as Bureo notes on a Kickstarter page, "We were given an amazing opportunity to bring our idea to Chile, where we could run our whole process from fishnet collection in the coastal communities to final production in Santiago. We began work last year, establishing 'Net Positiva', our fishnet collection and recycling program. Over this time we conducted research at a plastic engineering lab and manufactured our major production tools. Now that we have ridden our prototypes and proven our supply chain in Chile, we want you to be a part of our story to support the production of our boards!" After launching a Kickstarter, Bureo received an outpouring of support, nearly tripling their initial request for $25,000 USD. The funds have helped the company establish a line of skateboards and sunglasses, all of which evoke the brand's commitment to the sea. The skateboards, for example, look like fish, with curved bodies, split tails and scaly grips. And there's another layer to this thematic design--the brand is all about holistic production, the idea that the Earth's finite resources can be made infinite if recycled. Since 2013, the brand has recycled 10,000kg of nylon nets. And Bureo's trendsetting is influencing the broader industry. Reused nylon is becoming a staple for a lot of fashion brands including powerhouse environmental brand Patagonia. And as brands are finding out, there's huge potential for this market. Consumers want to contribute to healing the planet, rather than contribute to its destruction. In 10 years, who knows, maybe they'll be bidding wars for all the discarded nylon in the oceans!